At American Metal Roofs we take ice and snow seriously. Aside from our ice prevention products Ice Dam Cutter and Heated Shingle, we now offer Roof Ice Removal Service. If you have heavy ice and snow buildup or troublesome ice dams on your roof, don’t tackle them your self – call American Metal Roofs today! 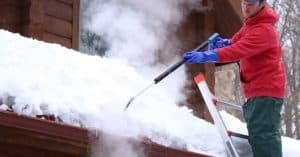 Utilizing a 290 degree jet of steam, our quick and gentle Arctic Steamer machine can remove most roof ice dams in a matter of minutes. 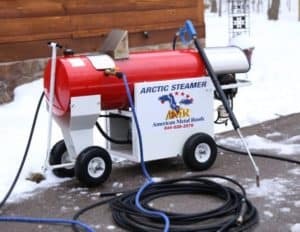 The Arctic Steamer produces super-heated steam under low pressure to rapidly melt damaging ice and snow and safely remove it from your roof and gutters. Hot water (150 degrees) compared to steam (300 degrees) takes twice as long to remove your ice. You pay twice as much! You also get to pay for the contractors time each time they run out of hot water and are waiting for more hot water to heat up in your hot water tank. You pay to heat the water. Steamers are not only the fastest but the safest. High pressure water near frozen roof material is not the best plan. Steamers convert cold water to super-heated steam and gently melts the ice twice as fast without any damage to your roof. 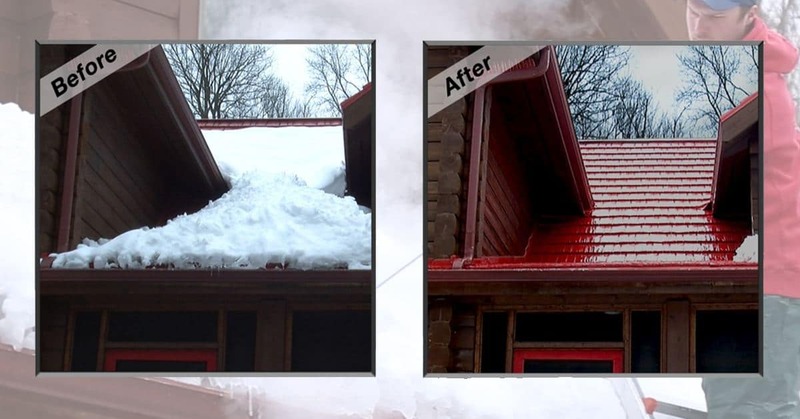 Call American Metal Roofs to schedule your Roof Ice Removal now! 844-638-2576! How soon can you remove my ice dams? Ice Dams are a serious issue. Our goal is to respond as rapidly as possible. We have crews strategically placed around the state to of Michigan to help you. When you call we will be able to tell you when we will be there. Call 844-638-2576 to schedule your ice removal! How long removal takes is dependent on how difficult your job is. The average job takes 2-4 hours to complete but it’s possible your job may take longer. The complexity of your roof, height and walkability will all play into how long it will take. A general estimate is 2 to 4 hours. Call 844-638-2576 to schedule your ice removal! Yes, we use steam. Many companies say they use steam when in fact they have equipment that is nothing more than a pressure washer. You will find steam is gentle unlike a pressure washer. The shingles on your roof depend on embedded stone granules to protect the asphalt coating underneath. Without these granules your shingles will deteriorate in a year or two. Pressure washers will remove the granules and destroy your roof. We have invested in the best equipment possible. You get what you pay for with Ice removal. Many use high pressure washers. The result is they have 80% less cost in equipment and can do the job cheaper. The end result is the roof is shot and you end up buying a new roof. You got a deal…just not a good deal. Our top priority is to safely remove the ice and avoid damaging your roof and home. Yes. We are fully insured and will be glad to provide you a copy of our insurance and a contact information of our insurance agent so you can verify the policy is in effect. Yes, we have a 2-hour minimum charge. We charge you only for the time we are there. This 2-hour minimum covers our travel. When we arrive we will have a truck and trailer full of equipment to do your job safely. We will begin work promptly. We need to clear our machines of anti-freeze, access a water spigot, unload and set up ladders, route hoses to the location of the actual ice dam BEFORE we can even start melting ice. Safety is a huge concern as we are working with water in freezing temperatures. Our first goal is to drain the roof by cutting a path through the ice to release the pressure of the water and drain the dam. Never believe a company that tells you there is no minimum charge or it may only take them an hour. Let’s be clear and honest. Ice removal is difficult. We believe in total honesty. That is how we have built our reputation. In our experience, with the best equipment, ice dam removal never takes less than 2 hours so we are not going to say it will be less. Call 844-638-2576 to schedule your ice removal! We wish we could but it is impossible. Snow covers the ice dam. This work needs to be done first to expose the size of the ice dam we are dealing with. A dishonest company would say they can. After they start the price goes up or they don’t finish. It is always more than they thought. It is not uncommon for them to not finish saying they will come back later and leave you with a mess. We would rather be honest and straightforward. Good equipment, good workers doing a dangerous job comes at a fair cost. Can you remove ice dams from my roof while I’m on vacation? We prefer to have someone there, but we can help if you are out of town. If possible we would like you to have someone there to communicate with us. We will be removing tons of ice from your roof. It will be nice for you to be able to verify with the person on site so you feel comfortable paying us upon completion. Can you remove ice dams while my business is closed for the holidays? Yes. We will need access to water. How do I know if you service the type of roof I have? We service all types of roofs. Do I need to have the ice removed? Sometimes you can wait it out and have the ice dams slowly but surely melt off of your roof and not into your home. The challenge is you don’t know how much your roof can handle. Will it leak and ruin your insulation and ceilings? Some gamble and wish they had not. Guess wrong and you will have a huge bill. Is there any way I can remove the ice dams myself? There is no safe way to remove the ice dams yourself. You risk killing yourself or damaging your roof (or both). There are products on the market that will melt a channel in the ice draining the ice dam. Once you have a huge ice dam the weight needs to come off the roof. At this point it has your building under huge stress..
Do those hockey-puck-shaped salt tablets really work? Simply, no. If they did everyone would be using them. The people who buy them are those who have never bought them before. And you guessed it, they do not buy them again. What’s the best way to prevent ice dams? Keeping your attic cool. We specialize in attic ventilation and solving these problems. Feel free to make an appointment with a roofing consultant by calling 844-638-2576. Will my insurance cover ice dam removal? Most will not. Good luck! Yes we offer a senior citizens and Military discount. You will also be eligible for a discount if you were to order other products from us to fix the challenges that are causing the ice dams. Why should I use American Metal Roofs? We are specialists when it comes to roofs. We have been in business since 2000 and have a Better Business Bureau rating of A+. Our goal is not only to remove your ice but help prevent the problem in the future. Our hope is this is the last time you need an ice removal service. Our focus is on the health of your home, and to fix the problem and not keep treating the symptom.